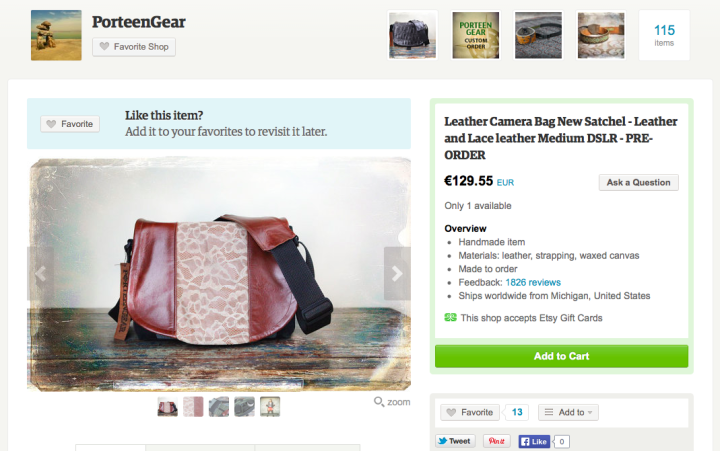 The Porteen Gear Compact Camera Bag – Design the bag you’ve always dreamed of having! 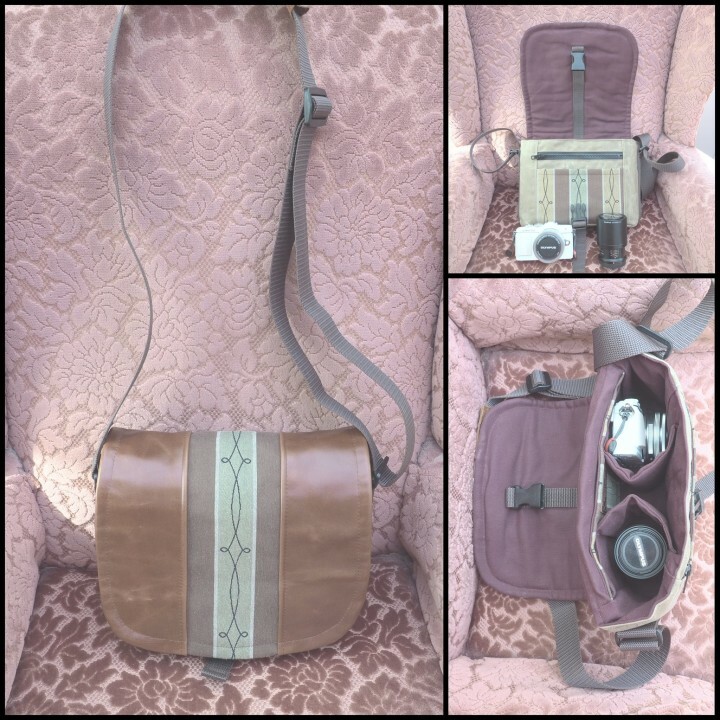 You are here: Home / Accessory Reviews / The Porteen Gear Compact Camera Bag – Design the bag you’ve always dreamed of having! As with many of my discoveries, I came across Porteen Gear while browsing around Etsy for unique mirrorless accessories to test. I was immediately drawn to the elegant design, attractive form and classic colours that epitomise the company’s series of camera bags, but my heart was won over when I saw that the designer and company founder, Robyn Porteen, also produces a series of compact bags for mirrorless cameras. To my delight, she was more than happy to send me a bag to test and review. The first and most important aspect I must highlight about Porteen Gear is Robyn’s Bag Builder service whereby you choose your preferred accent fabric, waxed canvas, interior colour, leather and strap for your bag. Having these five options to choose from ensures that every bag is unique and suits the personal style of the user. When I had my custom compact bag made, there was an overwhelming number of options to choose from, but the Bag Builder tool allowed me to visualise my bag on-screen (rather than just in my head). 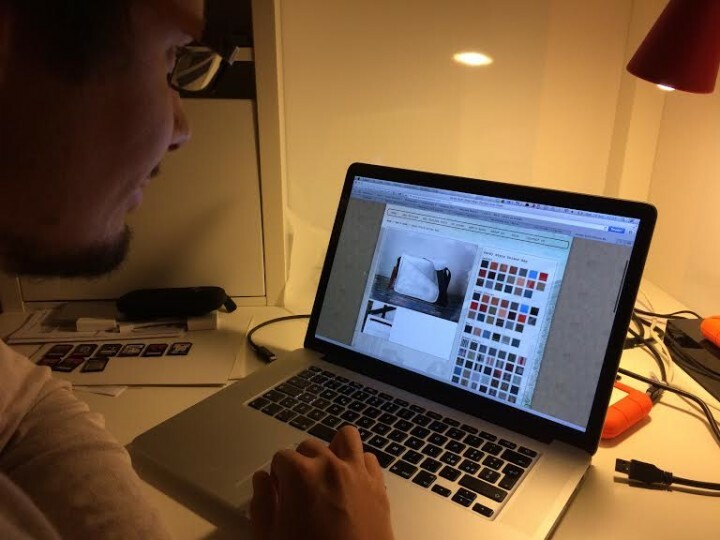 This made it easier to assemble a design with complementary colours. 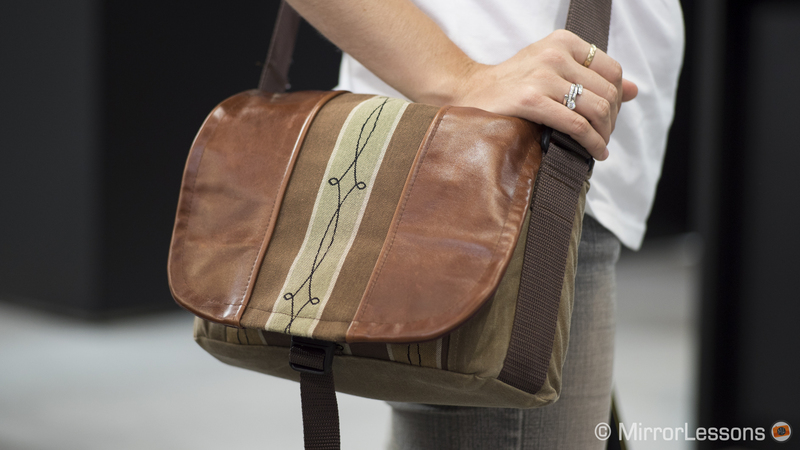 At the same time, if you aren’t bothered about designing your own bag or don’t feel confident about picking out your own material, you can also order a pre-made bag from the Porteen Gear Etsy store. I won’t go into full detail here as you can read an in-depth description on the Porteen website, but all her materials are ethically obtained and built to last. For instance, she only uses recycled leather from cows, and the heavy duty polypropylene she uses for the strap has a breaking strength range of 675 to 1800 pounds. 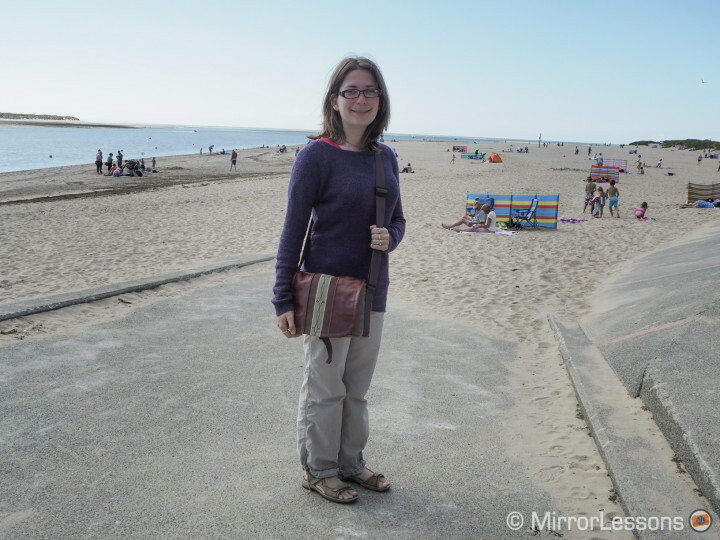 I can confirm from my own experience that despite the elegant outward appearance, this bag is definitely as fit for long treks up mountains and along beaches as it is for city walking. 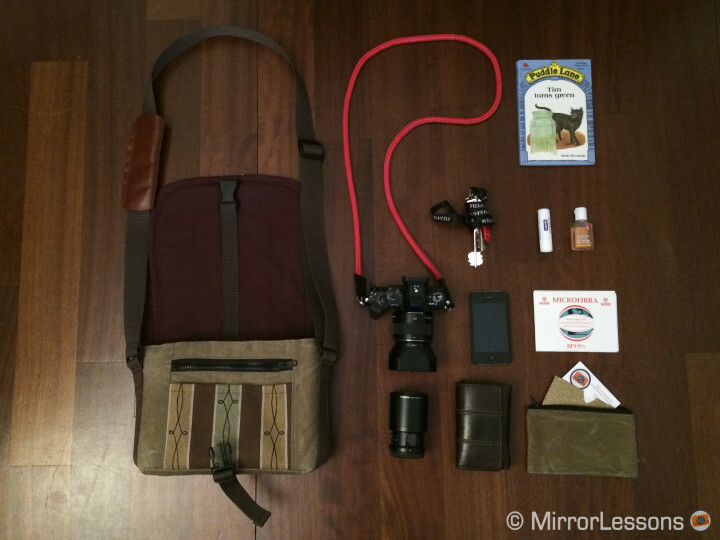 Despite being a very compact bag, it will fit a surprising amount of gear and personal belongings. 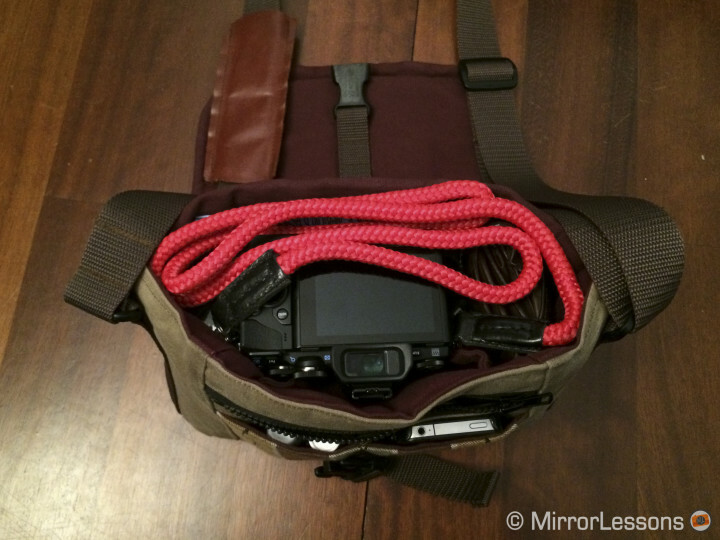 The space within the bag is separated by two fabric dividers that have been sewn to the interior and can be pushed against the edges if you are carrying around one of the larger mirrorless cameras or lenses. Below you can see exactly what I took with me yesterday on my way to one of my private lessons. I had the Olympus OM-D E-M10 with the 25mm for street photography and the 60mm macro, my wallet, my iPhone 5, a Sailor Strap for my camera, a micro fibre cleaning cloth, my keys, hand-sanitiser, lip gloss, a small flat pouch for business cards (provided by Porteen), and a small book to read to the child I teach. Due to the compact size and stylish appearance, it is easily mistaken for a ladies’ handbag. In fact, on various flights I took during our summer break, the airline permitted me to carry it along with my hand luggage (a backpack). Not once was I questioned about whether it was a camera bag or a handbag. 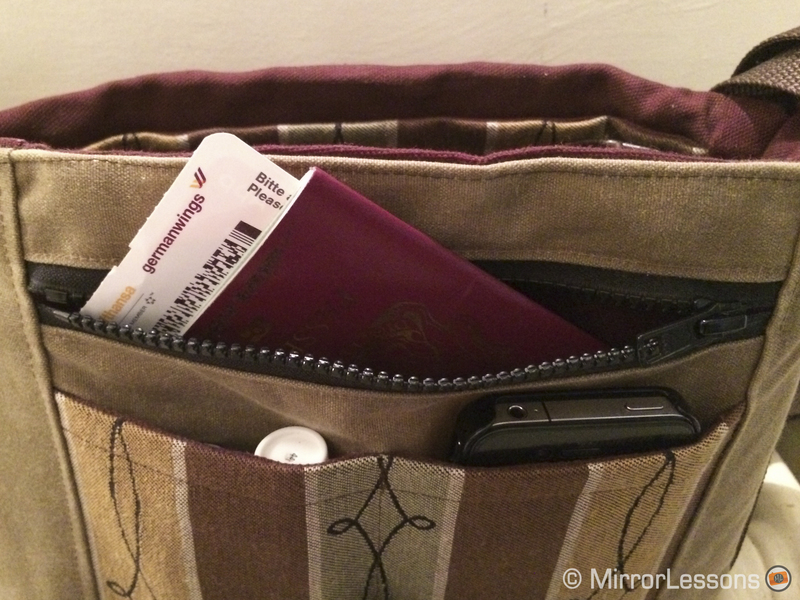 The bag closes with a buckle attached to the underside of the flap and the front of the bag. For a while, I thought I might have preferred a zipped closure at the opening like on the Oliday canvas bag but this would have reduced the amount of gear I could fit inside. 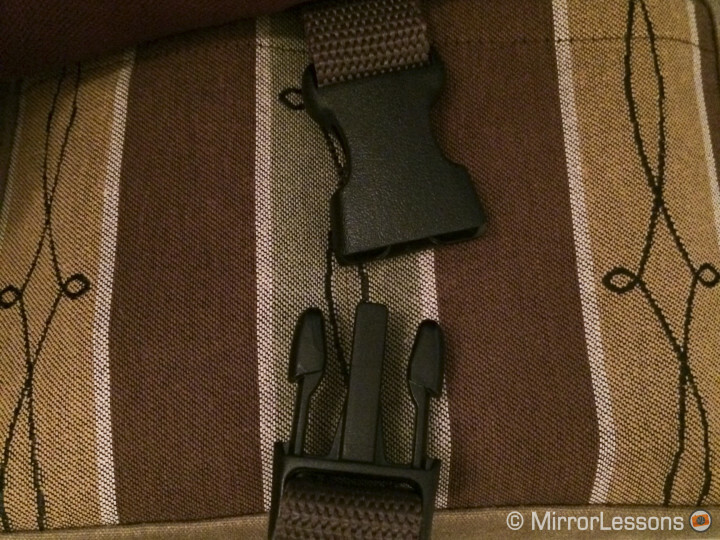 Since you can tighten the buckle quite a lot, there is no risk of your belongings falling out of the various pockets. Where you will find a zipper is along the front pocket, and it is here that I kept my passport and personal documents while travelling to Photokina in Germany. 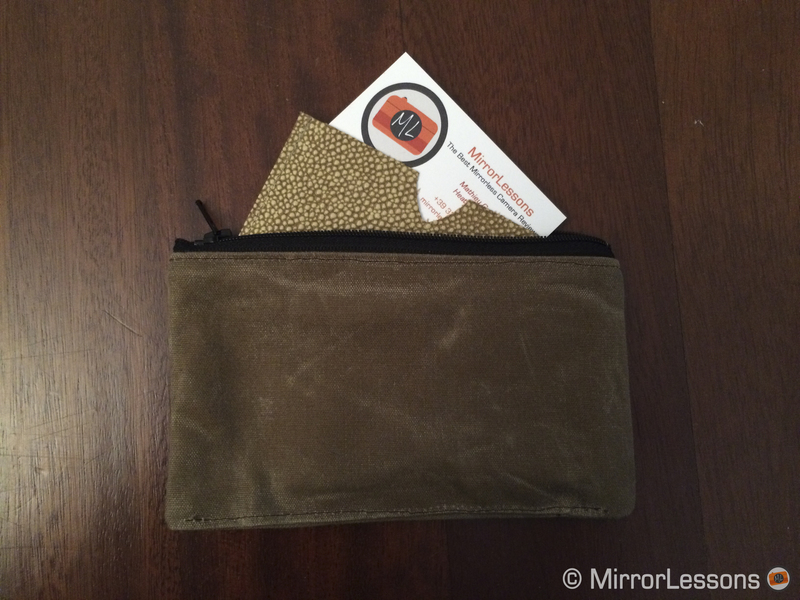 If you decide not to carry around a wallet, you can also use the above-mentioned pouch Robyn includes inside this pocket to keep your money, credit/debit cards and business cards safe. There are also two open pockets below the zipped pocket that are the perfect size for a smartphone and various small accessories such as memory cards, batteries, cleaning cloths and so on. When shooting isn’t the priority, you can also use them to keep other small things safe–lip gloss, make-up, hand sanitiser are a few examples that come to mind. 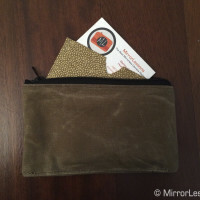 The small pouch for business cards, credit cards, bills and more. 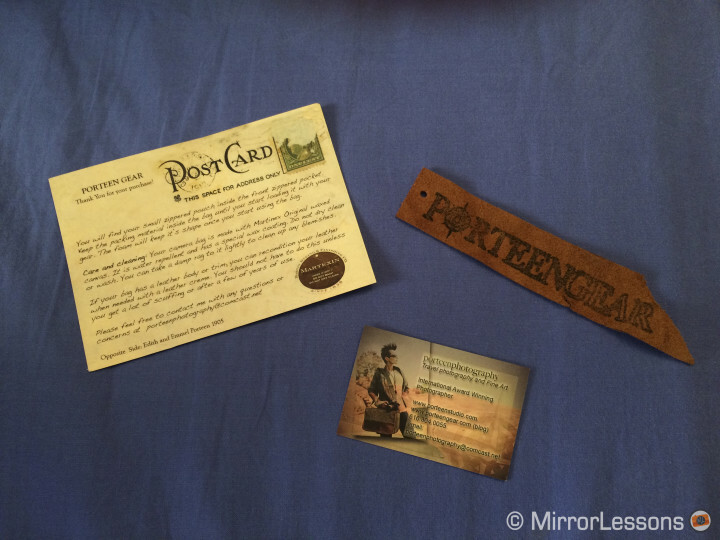 Attention to detail is another of Porteen Gear’s strengths. When I opened the bag for the first time, I was pleased to find a handful of beautiful Porteen Gear business cards, obviously meant to be handed out to my circle of camera-toting friends, a leather Porteen Gear label, and a postcard from the company thanking me for my purchase and describing how to care for the bag. From how I’ve been describing the bag, it may sound like the company is targeting women, and I have to say that this is true for the most part. However, there are also a number of masculine colours and designs to choose from. Below are just two examples I came up with using the Bag Builder. Sincerely speaking, there isn’t much I would modify about the Porteen Gear compact bag. One small disappointment was that the internal pocket cannot house a tablet. I tried inserting a Samsung Galaxy and an iPad mini, and neither fit because the pocket wasn’t deep enough. 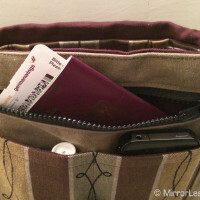 I also would have liked a flat external pocket on the rear of the bag, as I often like to slip pieces of paper or documents into my bag without actually having to open it. (Update: Robyn says she can add a back outside pocket for an additional $5.00!) Finally, the shoulder pad attached to the strap tends to slide around quite a lot, and even flip upside-down on some occasions. These are the only small criticisms I have. Since the day I first received the Porteen Gear compact bag, I’ve received nothing but compliments. While it is physically very attractive, it is also practical and extremely comfortable to use over long stretches, even if your activities include long walks and mountain climbing. 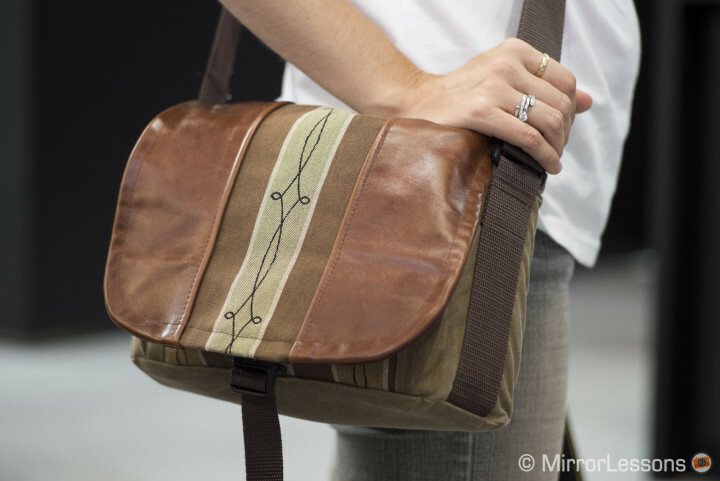 It is the perfect example of a practical camera bag disguised as a fashionable handbag. On top of that, you have the handmade custom-designed aspect that makes Porteen a more appealing option than your average factory produced camera bag. If you are looking for a unique handmade camera bag and want to have a say in how it looks, Porteen Gear is definitely the company for you. I think Mathieu will be getting a Porteen Gear bag for himself soon! 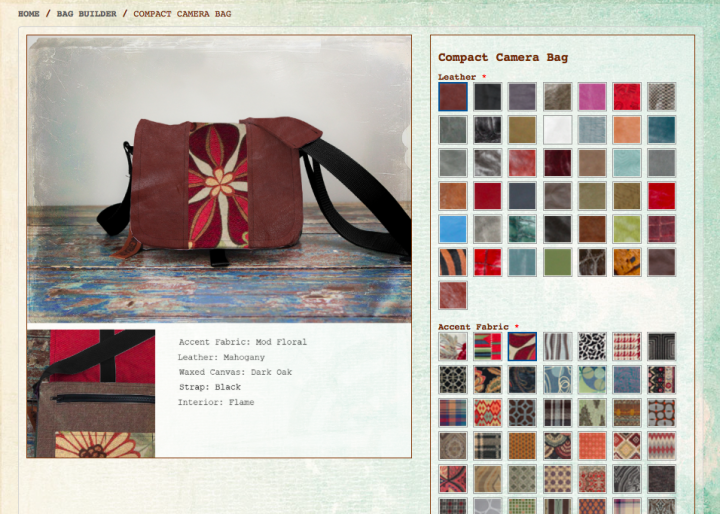 Create your own Porteen Gear camera bag today! Follow Porteen Gear on Facebook, Twitter, Pinterest and Instagram!